We all love choices, especially when we’re designing our brand-new ride. Many car brands allow customers to design their impending purchase, and Alfa Romeo is certainly included in this sentiment. The brand provides their customers with an array of options as they’re building their new ride, and this includes the impressive 2018 4C. If drivers are looking to truly customize their car, they won’t have any issues making it one-of-a-kind. Of course, no wheel is complete without a tire, and the brand also provides customers with a number of flashy options as they’re designing the bottom of their new ride. The vehicle comes standard with the 205/45R17 and 235/40R18 three-season tires, but customers can also opt for the available 205/40R18 and 235/35R19 three-season tires or 205/40R18 and 235 35R19 performance tires (which cost an additional $1,200). Finally, there are several exterior mirrors that a driver can choose from, including some that are adorned in satin ($150), carbon fiber, and carbon fiber with Italian flags ($300). Ultimately, each of these exterior options provides a different persona to your ride. Whether you’re seeking athleticism, style, or a combination of these two attributes, you’ll have that ability as you’re designing the 2018 Alfa Romeo 4C. If customers are looking to maximize that style and opulence, they can also opt for the leather-trimmed interior, which cost an extra $2,000. While the vehicle comes standard with the AM/FM Stereo Radio with accompanying Media Hub, there are still ways that customers can add on to this specific unit. For an extra $900, buyers can opt for the legendary Alpine Premium Audio System, which provides an unmatched listening experience. While the options aren’t as extensive as those available on the nameplate’s exterior, they’re still important enough where they could influence the entire driving experience. 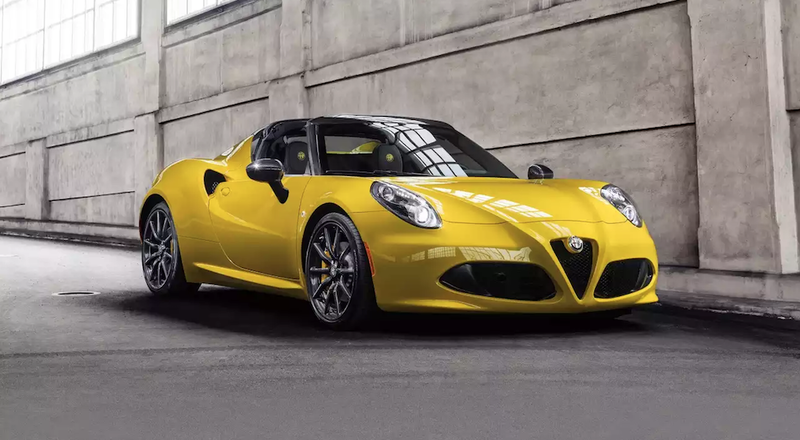 If you’re truly looking to elevate the already-impressive 2018 Alfa Romeo 4C, the brand included a number of available package options that will elevate your ride to a whole new level. Each of these packages adds specific amenities that elevated a specific attribute of the car. For instance, the Coupe Track Package 1 ($2,300) adds a number of race-inspired features, including a carbon fiber rear spoiler, a leather steering wheel, and a “race tuned” suspension. The Coupe Track Package 2 ($2,100) sees similar inclusions, although it eliminates the much-desired leather steering wheel. The Coupe Convenience Package ($1,400) is focused on providing drivers with the optimal driving experience. Engineers included a number of clever functions like the Cruise Control unit, Rear Parking Assist System, and the Security Alarm. Finally, the Carbon Fiber Interior Trim Group ($2,000) delivers what the name promises, adding a number of carbon fiber parts like air vents, cluster bezel, instrument panel bezel, and a shift bezel. The brand only provides customers with one engine offering, but the lone unit is still plenty impressive. The 1750 turbo four-cylinder engine manages to crank out an incredible 237 horsepower and 258 pound-feet of torque, leading to a 4.1-second 0-to-60 time. Accompanied by an impressive six-speed automatic transmission or manual twin-clutch transmission, drivers can anticipate an unmatched driving experience. Of course, there are still some final decisions to be made as you’re designing your new car’s powertrain. Alfa Romeo provides a number of different brake calipers, meaning owners can choose from black, red, or yellow inclusions to accent their ride. In terms of available amenities, the Alfa Romeo Battery Charger and the Akrapovic Dual Mode Center Mounted Exhaust will prove to be invaluable in any driving situation.